We have said many times that we hates nasty hobbitses. Yes, we hates them, precious, yes. But we hates elveses too. They tie up poor Smeagol with burning rope. They put Smeagol in prison. We hates them too. When they had us as a prisoner in the dark forest, they took us out so we could climb the trees. Nice trees. Nicer than elves. Smeagol likes to climb high and get away from the nasty elveses. One time when we climbed, orcses came and fought the elveses. The elves were so busy with the orcses that they don't see us, and we gets away! That is how it gets away from hobbitses or elveses it doesn't like! Isn't Smeagol clever? The Short Blogger forgot to let us answer the other questions! Silly Short Blogger! So we will do it now. Do you still have two-sided conversations? i.e. Gollum and Smeagol? We doesn't read much, no, not much anymore. But we knows the writing on our Precious. Yes, we thinks it is in Elvish. It says, "this is our Precious." We don't understand why Baggins would take it from us. It is ours! Yes, we talks to people and have these..."two-sided conversations." When we answers your question there are two of us talking, yes precious? We shouldn't answer silly questions. No, no, we likes to answer them. We likes it when people ask about ourselfs. Who needs them! They all like Baggins, not us. They do likes us! They follow our blog! They pretend to like us. I'm not listening! These people don't really like you. No, no... Leave them. We must get the Precious. Yes...no! Gollum, gollum. Again, great post! Hilarious and perfectly written like Gollum would write it. Thank you for somehow knowing when I need encouragement and leaving nice comments. You rock! We doesn't understand what it's going on about. We writes the posts! What have I found?? This is strangely delightful, almost...precious! What is this new commenter? Is it...nice? Does it like us, precious? It found our blog. We keeps it nicely. We are a good blogger. Good Smeagol. I am Miss Rachel6. I have lost the dwarves and I have lost the wizard, and I don't know where I am. Dwarves...and wizardses...we doesn't like wizardses. But maybe it is nice. It is lost? It can stay here on our blog. 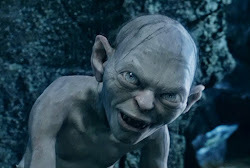 Read our posts, yes, read them precious! We works very hard on them.